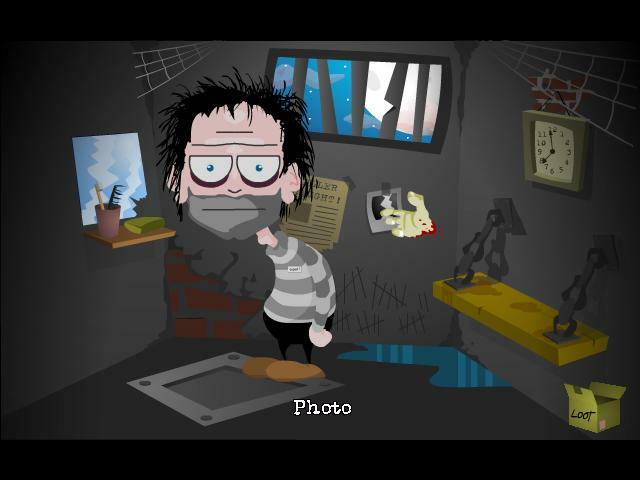 Help Earl Mansin escape from death row in this fully voiced graphic adventure. For more information, check out earlmansin.com Enjoy! 7/15/2007 - Version 1.1 released! Download it now and let 1.0 be die like the foul dog it is. This was a fun game with some pretty dark humor. Excellent game! I don't want to contemplate how long it must have took to do all those animations, I can't even do a walkcycle myself. Did you know this was included on a PC Format coverdisk, issue 226? That's where I got it from, too big for me to download myself. One thing: Once you've thrown the brick the first time, it's kinda hidden behind the shards and it's not obvious to pick it up again. The bicycle tube was a bit of a pixel scrape too. Otherwise, excellent. Hoping for a sequel! First of all I would like to say, that the effort to make this little game must have been incredibly high. Especcially the short video animations reach a high quality level and make the game very immersive. Graphics in the game are done well, although faces and characters in the game don't have a lot of character in my eyes. All characters in the game seem to have quite hollow personalities so I really didn't fall in love with one of them. But anyway, they are drawn in a very clean detailed way. What I didn't like were the homogenic puzzles: Most of them were clichee puzzles. There were about five "open-the-locked-door-or-cabinet" puzzles. This is really a pitty, because it's just "fill-the-game-with-nothing" stuff. Music was well sampled and fit very good to the game. The interface was comprehensible and clear as well. An enjoyable and hilarious game! When I get to play certain video games, I have the impression commercial video games quality can be surpassed. When I see how much effort was put into this (cutscenes, voices, graphics), I definitely think Earl Mansin was one of these games. Such a pity this one wasn't a full-length game! Good luck with your next game! Everything in this game cries high production value. From the very particular graphics, to the encompasing sounds and carefully picked music. It features full motion video animations, voice overs and witty dialog. The puzzles might be a bit too logical for their own good, as that makes them pretty easy. Still, I enjoyed solving them. A must play for everyone (except little kids, maybe). Very nice game. The puzzles are great, the graphics charming and the voice acting superb. This is probably the funniest and coolest adventure game i've seen in a while. Great job! Fun, logical puzzles, funny story, great music, awesome graphics, and superb voice acting. Can't wait for part 2!